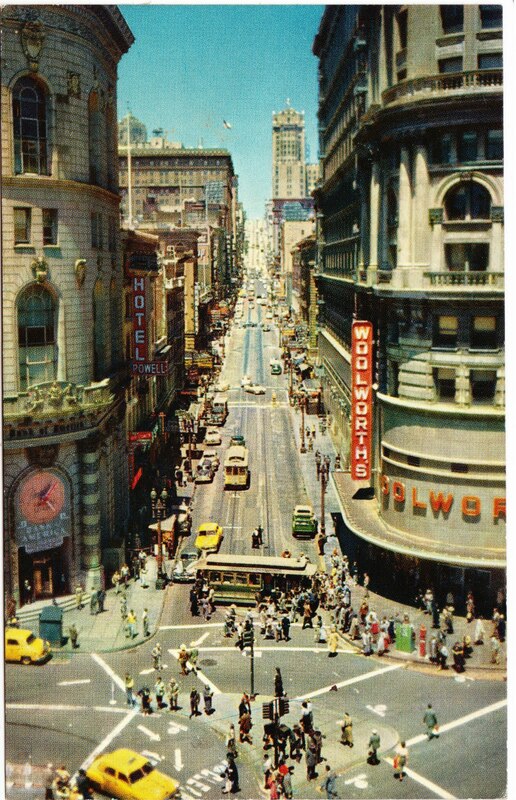 Check out some vintage street scenes on these postcards, and if you're snowbound in the Northeast on this Halloween weekend and looking for more to read, here's a guide to some of Papergreat's previous posts. Back-of-card info: It's from the English Pictorial Series, reproduced from a Real Colour Photograph and published by Valentine & Dons Ltd., Dundee. 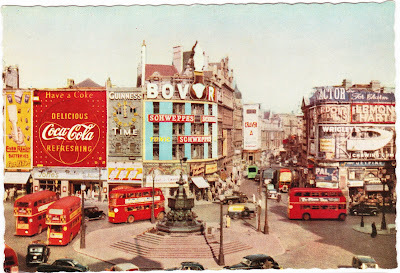 The caption states: "Piccadilly Circus is one of London's busiest centres, and is at the junction of several important streets. The Statue of Eros is seen at the centre of the picture." Back-of-card info: It's a Mirro-Krome card by H.S. Crocker Co., Inc., of San Francisco that was published by Smith News Co., 1338 Mission Street in San Francisco. 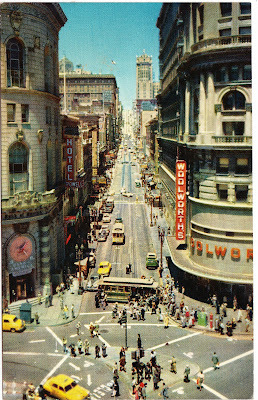 The caption states: "POWELL AT MARKET STREET, SHOWING TURNTABLE. At the foot of Powell and Market Street is the famous corner where the cable car is turned around bodily by the crew before starting the journey up the hill again. Color photo by Igor Stchogoleff." Back-of-card info: There's very little information on the back of this one. It was printed back when Mumbai was called Bombay. (The official name change occurred in 1995.) The card was produced by the Hindustan Paper Box Mfg. Co., Bombay. 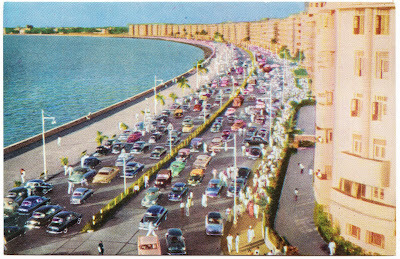 According to Wikipedia, Marine Drive is a three-kilometer boulevard in the southern part of the city. It is a 'C'-shaped six-lane concrete road along the coast, which is a natural bay. The official name for the road is: Netaji Subhash Chandra Bose Road. Most of the buildings along the road were built by wealthy Parsis and have an Art Deco look that was popular in the 1920s and 1930s.